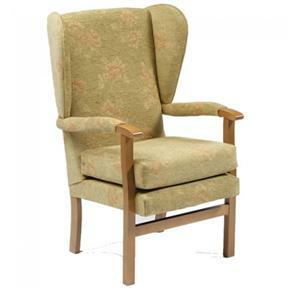 Jubilee High Seat Chair Represents Fantastic Value. The Jubilee high seat chair represents fantastic value for anyone who wants to make sitting a pleasure not a problem. Designed with the elderly in mind, the Restwell Range offers fireside elegance with excellent head, neck and lumbar support. With soft, inviting seats and back cushions they have been designed for hours of comfortable relaxation. Hand built hard wood frame is beautifully compact and is ideal where space is at a premium. Back care lumbar support and firm seat for extra support to the lower back. Polished knuckles and hand grips to help you rise easily and to minimise fabric wear on the traditionally upholstered arms. Built on the sturdiest of frames for maximum stability, represents an important safety feature. The seat cushions is reversible for even wear and removable for easy cleaning. The chairs are available in Sage and Gold colour fabrics. They will provide years of lasting comfort and support, with the highest standards in upholstery detail. The high back and elegant padded wings provide extra support, comfort and protection against draughts for the head, neck and shoulders. Fine fillings ensure that you are nestled in comfort. All fabrics and foams meet the UK Furniture and Fire Regulations. Available in a choice of sage or gold fabric. Very pleased with the product. Arrived on time. My disabled wife is delighted and we recommend. Very competitively priced. Great experience , web site easy to use, fast delivery, chairs good quality. Easy to order, fast delivery, excellent product! This was for my eighty eight year old mother who was delighted with the colour and the seat height which was the highest I could find. Excellent value too!